I am someone who loves salads for lunch. They are quick and easy. I prep all of my vegetables during the weekend (or a weeknight when I have time) so all I have to do is portion it out into my bowl, dress it and eat. When I have it all ready to go like that, I don’t have an excuse for not having something healthy and filling for lunch. Greek salad is one that is a little different and really delicious. I like to add some chicken breast or feta cheese to mine just to add protein, but I left it out of this salad. This Greek salad is one that I serve as a side salad with dinner, so the extra protein isn’t needed. I will switch and use either kalamata or black olives (whichever I have available). The kalamata olives are much stronger in flavor, so they’re not to everyone’s taste. The Greek vinaigrette is light, but full of flavor. It’s another one that I’ll just keep for several days in the fridge, and it’s so good. This is one salad recipe that everyone should have in their arsenal! 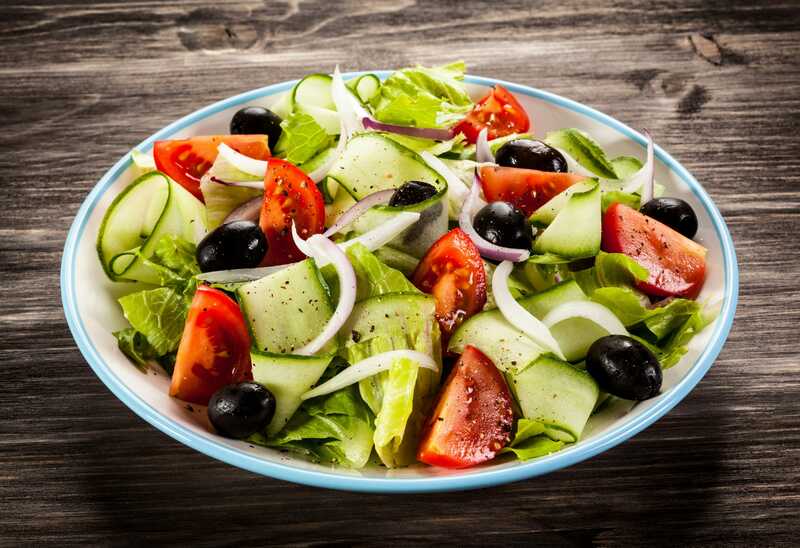 A light and refreshing salad with delicious low calorie Greek vinaigrette. Mix together the vinaigrette dressing and set aside. In a bowl, combine the salad ingredients in a large bowl. Dress the salad and toss to dress thoroughly.